- Location of training: Vietnam Japan University, Luu Huu Phuoc street, My Dinh 1, Nam Tu Liem district, Hanoi city. - Requirements on degree and working experience of applicants are detailed in the Annex 1. - Applicants who are expecting to receive their degree before 15th September 2019 are allowed to apply and supplement the required documents before the official enrollment. + For Master’s programs in Nanotechnology; Infrastructure Engineering; Environmental Engineering; Area Studies; Climate Change and Development: English certicate must be equivalent to the level of 3/6 (B1). After one year studying in VJU, students must submit English certificate of the level of 4/6 (B2) to be recognized as official students of the university. 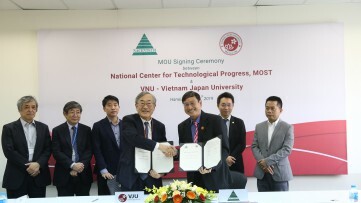 c) Holding a bachelor’s degree from an advanced training program under MOET’s Project on advanced training in some Vietnamese universities; from an international standard/talented/high quality training programs of VNU. d) Holding a bachelor’s degree in English language. a) Holding a Japanese language certificate of at least JLPT N2. c) Holding a bachelor’s degree in Japanese language. d) Holding a certificate of completion of the preparatory Vietnamese course offered by the University of Social Sciences and Humanities, VNU or by an institution licensed by the Ministry of Education and Training for preparatory Vietnamese courses. Note: The English, Japanese and Vietnamese certificates must be valid in 2 years since the exam date until the day of the application deadline. - Having good health for study. - Interview schedule for both 1st and 2nd admission in the I.2 of the announcement. Based on the number of applicants and interviewees, time for interview will be arranged appropriately by the Admissions Board. - Interview process: An applicant will have 10 – 30 minutes for preparation and 15 -30 minutes for interview. Applicants for Business Administration master’s program have 30 minutes to write an essay before interview. - Language used for interview: Applicants will be interviewed in English. Applicants for Area Studies: Oriented Japanese studies will be interviewed in Japanese and Oriented Vietnamese studies will be interviewed in Vietnamese. - Interview method: Subcommittees will ask questions directly and applicants will answer. The interview process will be recorded. - Minimum score for admission is 50 points (the highest score is 100) including application review, essay writing skill check (Business Administration) and interview results. + No applicant left in the list of candidates who are decided to be conditional enough for admission by the Admissions Board. The entry score for Master’s programs will be calculated on the number of competent applicants who are chosen by the Admissions Board. 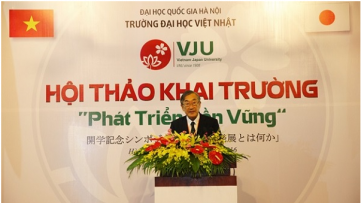 After the list of successful applicants are approved by the VNU, Vietnam Japan University will inform to the applicants and decide the list of official students of Master’s programs. Decision on the list of official students will be completed before 10 October 2019. - Application forms are available at the Admission Office of Vietnam Japan University. The applicants may download application forms from the website of the university at www.vju.ac.vn. - Applicants may submit application documents at the university or by post. - Application receiving period: From Monday to Friday during office hours. - Tuition fee: VND 75,000,000 (Seventy five million Vietnamese dong) for the 2-year master’s program. All applicants shall be requested to pay the application fee when submitting the applications. The successful applicants must pay the admission fee and a part of tuition fee at their official enrollment. b. In cash at the Admission Office during the office hours. - The admission fee does not include travel, meals and accommodation expenses during the stay for the entrance examination. Address: R.509, 5th Floor, My Dinh Campus, Luu Huu Phuoc Street, My Dinh I Ward, Nam Tu Liem Distric, Hanoi.